Amini Mashhadi, H., Rastgoo, A., Vahdati Khaki, J. (2008). An Investigation on the Reduction of Iron Ore Pellets in Fixed Bed of Domestic Non–Coking Coals. International Journal of Iron & Steel Society of Iran, 5(1), 8-14. H. Amini Mashhadi; A. R. Rastgoo; J. Vahdati Khaki. "An Investigation on the Reduction of Iron Ore Pellets in Fixed Bed of Domestic Non–Coking Coals". 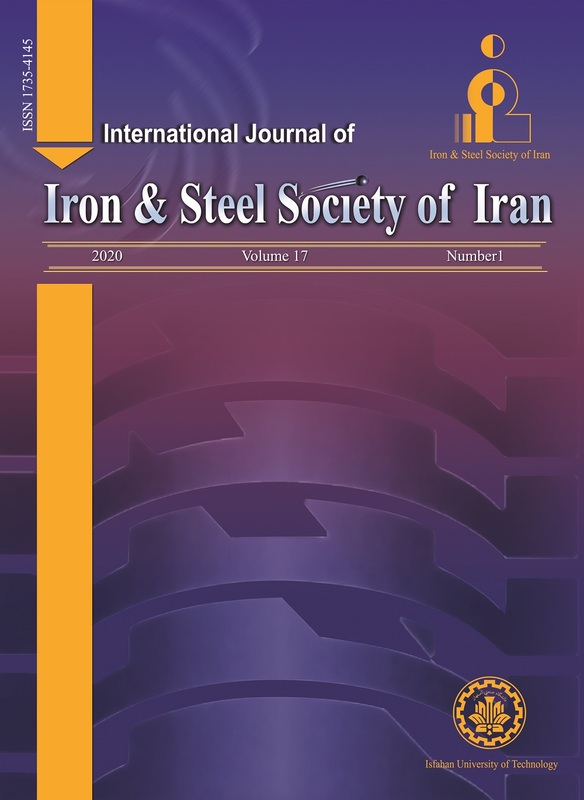 International Journal of Iron & Steel Society of Iran, 5, 1, 2008, 8-14. Amini Mashhadi, H., Rastgoo, A., Vahdati Khaki, J. (2008). 'An Investigation on the Reduction of Iron Ore Pellets in Fixed Bed of Domestic Non–Coking Coals', International Journal of Iron & Steel Society of Iran, 5(1), pp. 8-14. Amini Mashhadi, H., Rastgoo, A., Vahdati Khaki, J. An Investigation on the Reduction of Iron Ore Pellets in Fixed Bed of Domestic Non–Coking Coals. International Journal of Iron & Steel Society of Iran, 2008; 5(1): 8-14. In this study, the isothermal reduction of iron oxide pellets, made of Iranian Chadormalo, Gole-gohar, and Sangan iron ores, was investigated in the temperature range of 900-1100°C. Tabas, Pabdana, Babnizoo, Karmozd, and Shahrood domestic coals were used as reductants. Parametric studies were performed and the effects of such factors as temperature, average particle size of iron ore and coal fines, pellet size, and BaCO3 additiveon reduction process were investigated. It was found that both the rate of reduction in the early stages of the process and overall reduction increased for all the iron ores used with increasing temperature. Overall reduction, however, decreased when the size of Sangan iron ore pellet incraesed. It was laso observed that the rate of reduction decreased when the particle size of Sangan iron ore fines increased at the early stages of the process but increased thereafter during the process. The rate of reduction and the overall reduction in Sangan iron ore also increased considerably when BaCO3 was added to Tabas coal at 1100 °C. Finally, a kinetic study was performed for reduction of Sangan iron ore using Tabas coal to determine the activation energy of the reduction reaction. It was found that the activation energy decreased from 159 to 133 kJ/mol by increasing the BaCO3 content from 0% to 5%. J. J. Spivey, B. H. Carpenter and C. W. Westbrook, Iron and SteelEng., 59(1982), 49. R. Stephenson and R. P. Smailer, eds: Proc. ISS-AIME,Warrendale,PA, (1980), 149. Q. Guanzhou, L. Yongkang, J. Tao and H. Yuehua, J. Cent. S. Univ. Technol., 2(1995), 27. I.Sohn and R. J. Fruehan, Metall. Mater. Trans. B, 37(2006), 223. C. G. Davis, J. F. Mc Farlin and H. R. Pratt, Ironmak. Steelmak., 93(1982), 90. J. J. Moore: J. Metals, 39(1982), 134. R. Haque, H. S. Ray and A. Mukherjee, Scand. J. Metall., 21(1986). Q.Wang, Z. Yang, J. Tian, W. Li and J. Sunm Ironmak. Steelmak., 24(1997), 457. S. K. Dutta, A. Ghosh, Metall. and Mater. Trans. B, 25B(1994), 15. K. Otsuka, D. Kunni, J. Chem, EngngJapan, 46(1969). F. Ajersch,Can.Metall. Quart., 26(1987), 137. C. E. Seaton, J. S. Foster and J. Vlaseo, Trans. Iron Steel Inst., 23(1983), 490. C. Bryk and W. K. Lu, Ironmak. Steelmak., 13(1986), 70. C.E Seaton, J. S. Foster and J. Velasco, Trans. ISIJ, 23(1986), 490. G. P. Decarvalho, G. Q. Netto and J. C. D. Abreu,Can.Metall. Quart. 33(1994), 217. F. Camci, S. Iydin and C. Arsalan, Turkish J. Eng. Env.Sci. 26(2002), 37.